South Africa suffered from a historical lack of freight-flow information that was detrimental to infrastructure planning, optimal network development and market structuring. This paper proposes a methodology that can fill this gap, be repeated annually and is, by its nature, not prone to the errors of market surveys. The methodology develops a comprehensive description of South Africa's surface freight flow market space based on the definition of four definitive freight flow market segments. The results from the annual South African National Roads Agency (SANRAL) traffic counts are allocated to these segments to develop national road freight flows. For rail freight flows, the rail database is reclassified on a station-to-station (i.e. origin-destination) basis to match the freight flow market segments developed. Consequently, modal flows, market share and total flows for all freight flow market segments and the geographical groupings with the segments can be analysed and reported each year. The results confirm the deteriorating role of South Africa's rail system amidst growing freight demand, as well as the concomitant over-cropping of the road network, and therefore enable the development of specific national freight transport policy recommendations. 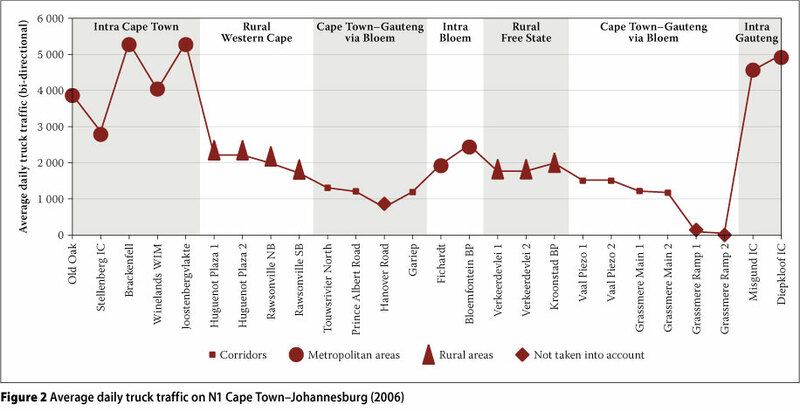 Accurate market information about freight flow was not historically available in South Africa, which compromised planning for optimal network development (Conradie 2007). Historically, freight transport in South Africa was railroad-driven and formal statistics were available for this sector. Following transport liberalisation and eventual deregulation, rail freight market share declined and flow statistics became increasingly elusive. The only historical studies that attempted to measure freight flows - the studies of Verburgh (1958 and 1968), Smith (1973), Hamilton (1983 and 1986) and Pretorius (1991) - had limited success, and no permanent data set of freight flows (including modal market share and size) by mode was ever established. Furthermore, their work was not repeatable given the substantial effort required to carry out the research according to the survey methodology. Even the work of Statistics South Africa was discontinued in 2003 owing to issues with validity. This paper proposes a new approach based on a different methodology that can be repeated annually, and is less subject to human error and the 'lie' factor encountered in the survey method. The objectives of the proposed national freight flow model (NFFM) are firstly to provide the first annually repeatable observations on modal market share and freight flows in South Africa for use in infrastructure policy decisions and planning, and secondly to provide lead and lag indicators of the performance of the freight transport network. Despite the lack of detailed information the challenges experienced in the surface freight flow market space have been well documented by government, researchers and the media (DoT 1998 and 2005; CSIR, Imperial Logistics & University of Stellenbosch 2010; Van Eeden & Havenga 2010). The challenges caused by the modal imbalance (between road and rail) are not sustainable, but the development of more optimum solutions requires the availability of appropriate market intelligence. In the case of South Africa where, in the collective consciousness, rail has mostly been relegated to a provider of bulk transport services, this market intelligence includes a renewed understanding of the drivers of rail sustainability. This is expounded in the next section. In normal rail economics about 75% of costs would be fixed over the short term and 50% over the medium term. During deregulation traffic will shift from rail to road (especially time- and value-sensitive cargo), with a concomitant loss of income. but only a partial reduction in costs. This shift will be accelerated and pronounced in the absence of intermodal solutions. The remaining fixed costs would have to be cross-subsidised from 'rail-captured' freight in the short and medium term. In the absence of cross-subsidisation the remaining traffic would have to shoulder a significant tariff increase, which would result in more traffic shifting to road. Cross-subsidisation did occur to some extent between rail's export lines and general freight, making South Africa's 'captured' rail traffic slightly less competitive. This was partly offset by state-of-the-art world-class engineering, especially on the export lines. Relative tariff growth on some higher-value, time-sensitive freight did occur at faster than PPI growth rates, but this exacerbated the problem as more traffic left the railway. The loss of income, amidst high fixed costs, resulted in declining investment and expenditure on maintenance, inducing further freight losses and a self-reinforcing downward spiral. Rail decline on shorter haul is allowed to continue and the railways concentrate on bulk heavy haul over long distances (the American model). Investment is made in intermodal solutions to get the best of both possible worlds (part of the European and American models). Re-regulation (part of the European model). Congestion and social factors in South Africa necessitate the adoption of the European model. South African railway management in the mid-1990s, however, planned for the American option, even though this would have been impossible to implement due to inter alia potential job losses and strain on road infrastructure. The impact of deregulation was therefore compounded by poor strategy and the fact that assets were allowed to deteriorate even further to the brink of collapse. No investment in intermodal solutions occurred, and these problems were exacerbated by an absence of guidance from the policy makers, the failure to develop a revised national transport policy following the De Villiers deregulation report, and a lack of implementation of Moving South Africa initiatives. One of the major causes of this situation was a poor understanding of the freight flow market segments, the real trends in transport volumes for these segments and the limited or erroneous assumptions that followed this shortage of information. The belief was that rail decline was 'normal' (erroneous: the decline should not have been so pronounced for corridors and especially high-density, long-haul corridors); that it was caused by poor service (erroneous: poor service was not the only cause of decline, as the events described above highlight); and that it was not rapid (erroneous: this was masked by the rise of 'rail-captured' export machines and the concomitant absence of a network view). 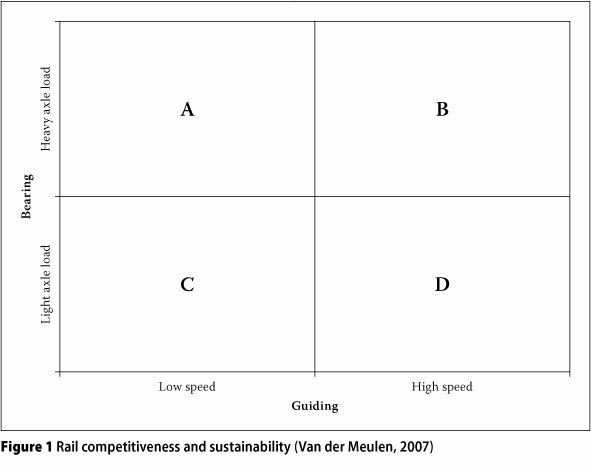 The drivers of rail sustainability are best described by comparing or offsetting the positive contribution of a railway to an economy, together with its disadvantages. A railway will, under the right circumstances, save an economy money and provide systemic access for freight and passenger movements and environmentally sustainable transport solutions. These advantages should be offset or compared to rail's major disadvantage, i.e. that it provides only one degree of freedom of movement. The only way in which the advantages of rail can be monetised in the face of its disadvantage is by its not competing with other modes directly, but by exploiting the intrinsic technologies of rail, i.e. its bearing, guiding and coupling technologies compared to the capacity that it can leverage. Bearing indicates the weight of axle load that can be maintained and, therefore, volumes. Guiding indicates the wheel on track differentials and, therefore, the speed of movement. Coupling refers to long trains with massive volumes. Combined, these technologies provide high-volume, longdistance solutions (Van der Meulen 2007). Figure 1 depicts two drivers of these intrinsic rail technologies - the speed of guiding and the axle load of bearing. ■ position D is suitable for general freight solutions in a regulated environment. Van der Meulen (2007) maintains that all railways in the D group (where South Africa's rail system is located) will gradually become redundant and that the problem can only be solved at the state level, where it was created (i.e. by redesign). South Africa's rail system was designed without A, B and C in mind; it was highly regulated for a long time (and was able, therefore, to survive for a long time), but was destined to fail with deregulation. This failure is, therefore, a combination of the incorrect application of rail economics caused by de-densification of loads (as a result of deregulation), which in turn was caused by the absence of intermodal solutions and rail network design errors. All of these errors could have been avoided by macroeconomic research on actual freight transport demand, coupled with design options to meet that demand in a sustainable package of solutions and design. Macroeconomic research of this kind requires time-series information, and to understand this it is necessary to see the detailed picture that underlies the freight flow market segments and the trend in traffic movement across the segments. The methodology to develop this research is explained in the next section. The NFFM focuses on defining surface freight transport (i.e. road and rail) based on the two definitive measures of flows, namely tons and ton-kilometres. Due to the nature of the input information for road data (described in the section on road freight flows), the model produces aggregate tonnages as well as corridor flow estimates, but not at the level of detailed origin-destination flows. Certain trucks that were counted may have been traversing more than one of the three freight flow market segments, i.e. corridor, rural or metropolitan, and even more than one geographical grouping within the freight flow market segments without the specific distinctions being determinable1. This is technically correct, especially where the data and research are used for planning purposes, since this freight impacts on (the infrastructure of) more than one segment. The specifics of this observation should, however, always be borne in mind and, when the model application is repeated, the same set of assumptions should be applied. The impact of cross-border traffic on South Africa's network is included, due to the presence of counting stations on all the routes to and from the border posts. It is, however, not possible to isolate the actual cross-border traffic for impact analysis on border posts and neighbouring countries. This is being addressed through engineering access to border post information from the Treasury, as well as initiatives to conduct input-output modelling for neighbouring countries. The model as presented in this paper is a descriptive model fitted on historic data. This established base makes correlation analysis with GDP and other macroeco-nomic variables possible, which renders the model useful for forecasting in future. 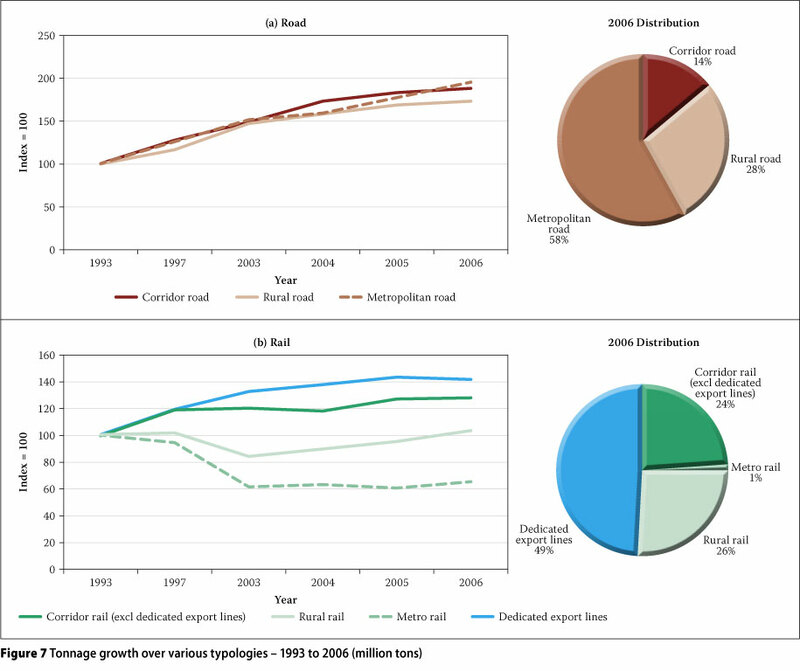 Subsequent to the development of the NFFM, a detailed origin-destination model was, however, developed for South Africa, based on the input-output model, with a 30-year forecast (Havenga, Simpson & Fourie 2011). The relative ease of updating of the NFFM (compared to the onerous input-output model) allows the two models to act as invaluable mutual validation tools, and the validity of both models have been established and is being tracked over time (CSIR, Imperial Logistics & University of Stellenbosch 2010). The first step is to develop a definitive definition of the surface freight transport driven by appropriate freight flow market segments. 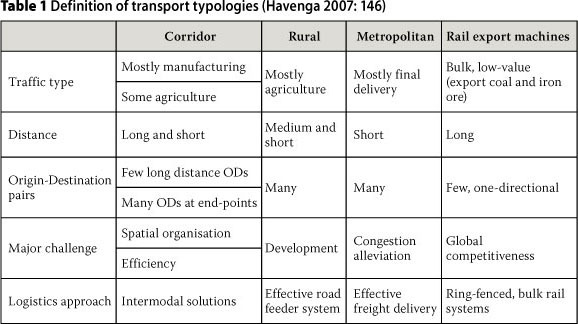 Given that the modelling objective was to understand freight flows to facilitate infrastructure planning, segment definition was driven by a geographical approach and an iterative process was followed - the segments were defined at the outset to facilitate data classification, but once the data had been analysed, outliers were interrogated to ensure that the market description was appropriate. This resulted in the following overarching segments: corridor, metropolitan, rural and rail export machines. The latter are South Africa's world-class, dedicated, bulk mining export flows - a captive market for rail and therefore showed separately. The salient characteristics of each freight market segment are compared in Table 1. 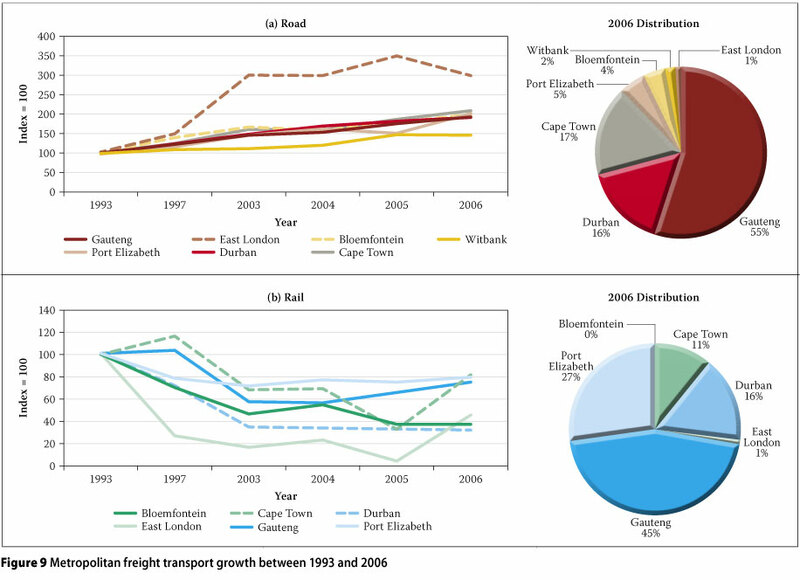 Subsequently, the results from the South African National Roads Agency Ltd's (SANRAL) Traffic Counting Yearbooks, compiled by Mikros Traffic Monitoring (2005 and 2006), as well as actual rail freight flow data obtained from Transnet Freight Rail, are classified according to these segments to develop total freight traffic flows in South Africa. The rail freight data obtained by previous researchers was one-dimensional, i.e. it provided only volumes shipped and not rail traffic flows between origins and destinations. Transnet Freight Rail (TFR) made detailed origin-destination rail flows available, which are adequate for use in this model, as TFR is virtually the only rail freight operator in South Africa. Rail freight flows therefore do not have to be modelled, but still have to be allocated to the freight transport market segments to allow market share comparisons between road and rail. Transnet Freight Rail has subsequently added this classification system to its core database, which enables, and fast-tracks, the use of rail's historical data and the annual repeatability of the model. Comprehensive traffic observations started in South Africa in 1984 with a pilot study on the 600 km N3 route between Johannesburg and Durban. As a result of the success of this study the National Transport Commission (now SANRAL) decided in June 1985 to expand the Traffic Counting Network to traffic counting stations (Mikros 2006, p iv). SANRAL now repeats this work annually and a reasonable degree of stability in the work process has been achieved since the 1990s. The main objective of SANRAL's efforts is not to develop freight flows, but to understand congestion points and enable planning in terms of all vehicular road usage in South Africa (of which heavy vehicles are only a subset). No attempt has ever been made to use the information for freight flow estimation purposes, and a reasonable amount of modelling of the available data is therefore necessary. The SANRAL Traffic Counting Yearbook is a compendium of traffic information obtained at traffic counting stations on primary roads, which highlights the latest available traffic characteristics. Both permanent and secondary stations are utilised. A permanent station makes continuous traffic observations; a secondary station is one where traffic observations are made on a sampling basis for at least 168 consecutive hours per annum. The 2006 SANRAL Traffic Counting Yearbook contains information on 398 permanent stations and 430 secondary stations. However, the position and number of the secondary stations change from year to year - an issue that the modelling process should consider. The stations are placed on selected links of the national and primary road network and yield information such as average daily traffic and average daily truck traffic (Mikros 2006, pp i-ii). The data from these counting stations were manually captured in an Excel database, because SANRAL does not provide computerised data sets. It is a secondary objective of this work to negotiate the electronic provision of data from SANRAL in order to facilitate the repetition of this work by limiting the possibility of human error and by fast-tracking the data capture. In addition to being recorded at permanent and secondary stations, the counting station data is automated and, therefore, far less prone to human error. The data is also available annually, which means that a validated model is easily repeatable. The number of permanent counting stations per annum are shown in Table 2. 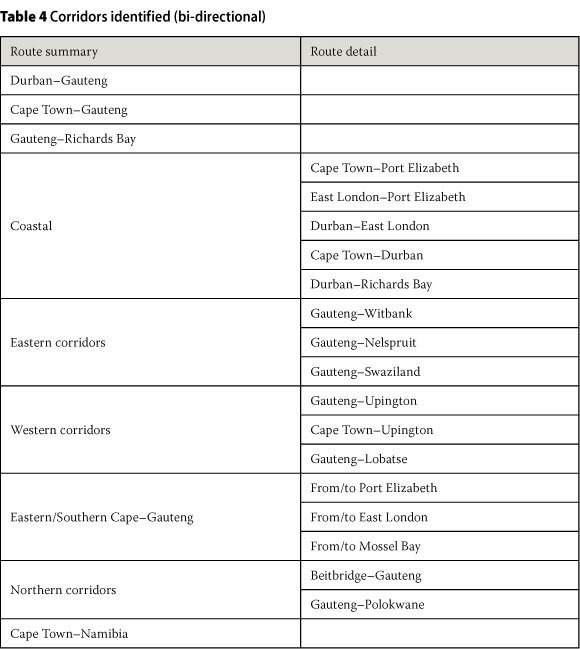 ■ SANRAL allocates counting stations to specific routes across the country, e.g. N1, R30, etc in a geographical order. For example, the N1 stations start in Cape Town and end in Beitbridge. ■ The average daily truck traffic (ADTT) (i.e. the number of trucks) and the percentage split of these trucks between short, medium and long trucks (SMLT) are captured at each counting station per route from SANRAL's data. The SANRAL counting methodology enables the counting monitors at the stations to distinguish between trucks and passenger vehicles by the length of the vehicle2. The trucks can then be categorised further in terms of axles. This provides a good approximation of vehicle types. ■ ADTT is the total number of trucks observed in each direction during the actual period monitored, divided by the total number of hours monitored, multiplied by 24. - A short truck is typically a rigid-chassis, two-axle vehicle designed for the transport of goods, or a bus with at least one of its axles bearing four wheels3. - A medium truck is typically a truck-tractor, plus semi-trailer combination. - A long truck is typically a combination of a truck-tractor plus a semi-trailer and a full trailer. - A vehicle shorter than 4.6 m is always regarded as a light vehicle, not a truck. - A vehicle between 11 m and 16.8 m is classified as a medium truck, irrespective of the chassis height. - A vehicle longer than 16.8 m is classified as a long truck, irrespective of the chassis height (Mikros 2005, p 10). ■ The number of trucks had to be translated into the actual weight of the freight. For this purpose two figures were calculated - the gross weight (i.e. truck + freight) and the truck tare (i.e. truck weight only). The difference between the two figures is the weight of the freight itself. 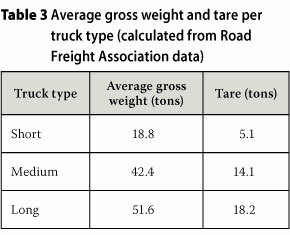 ■ The average total ton per SMLT was calculated from Road Freight Association (RFA) data. The total weight per SMLT was calculated by multiplying the truck mass by the number of trucks. The tare for SMLT was then calculated based on the average tare per vehicle type as published by the RFA (see Table 3). ■ For the national routes, counting stations were depicted graphically to determine the split between metropolitan peaks, rural traffic and long-distance (corridor) traffic. ■ Corridor traffic: the stations where levelling occurred were allocated to national routes. The average of the annual weight for all the counting stations per corridor was calculated to reflect the tonnage per corridor. ■ Metropolitan traffic: the key metropolitan areas were identified (through sharp peaks in traffic counts). Different routes lead into these metropolitan areas. For each route the annual average was calculated. The annual totals per route were aggregated to obtain the metropolitan traffic total. ■ The remaining stations were allocated to rural traffic. In the same way as metropolitan traffic (where a group of different routes combine to form a metropolitan freight market segment), each province has a number of rural routes that also combine to form a rural freight market segment. For each route, the annual average was calculated. The annual totals per route were aggregated to obtain the rural traffic total. 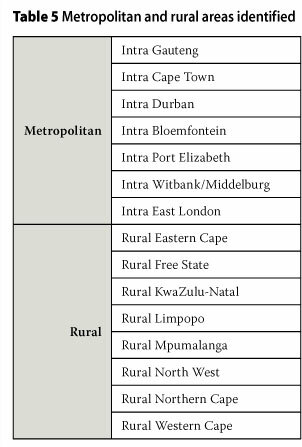 ■ Extreme outliers were discussed with SANRAL who indicated problems at these counting stations - these outliers were therefore excluded from the analysis (i.e. 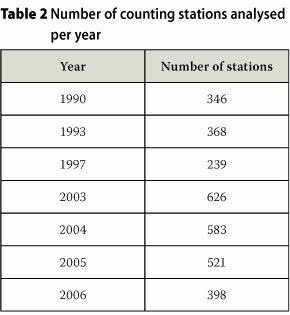 counting stations which gave figures that were significantly higher or lower than other stations on the same route, and often significantly different from a series of adjacent stations, also clearly visible in the graphs). For illustrative purposes, Figures 2 and 3 graphically depict the Cape Town-Johannesburg and Durban-Johannesburg routes for 2006. (All the SANRAL routes are depicted in this fashion to enable allocation of counting stations). The defined freight market sub-segments were grouped geographically to facilitate analysis, reporting and the development of recommendations. The two main corridors, i.e. Gauteng-Durban and Gauteng-Cape Town, deemed to carry the heaviest traffic, were however kept separate. The corridor grouping is shown in Table 4, while the metropolitan and rural groupings are shown in Table 5. The results from the NFFM were tabulated to provide modal market share per corridor, rural area and metropolitan area in South Africa. The methodology was applied to counting data from counting stations and actual Transnet Freight Rail data for 1993, 1997, 2003, 2004, 2005 and 2006. This application would, therefore, indicate (i) whether a comparable link with the previous sporadic surveys of Verburgh, Smith, Hamilton and Pretorius, which ended in 1990, could be established; (ii) whether the data from the late 1990s (obtained using this model) up to 2006 has a reasonable correlation with GDP; and (iii) whether the 2003 to 2006 data (when the model was applied annually) seems stable and useful enough to serve as the basis for an annual model. The results from the modelling exercise are reported in the next section. Total freight flows in South Africa amounted to 1 493 million tons in 2006. 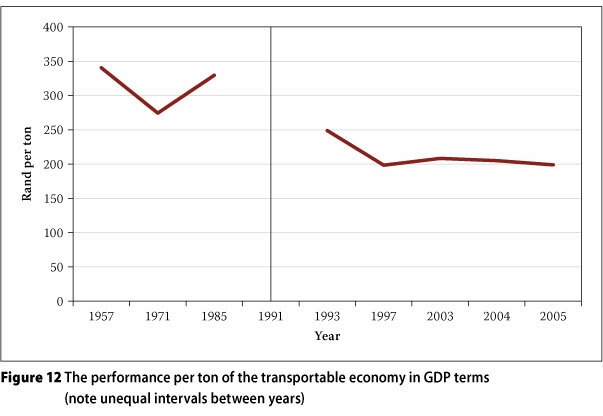 The trends for road and rail between 1993 and 2006 are depicted in Figure 4. The long-term trend in surface freight transport can be scrutinised by plotting the results from the NFFM with those of historical surveys, as depicted in Figure 5. Irrespective of the flaws of previous surveys, the definite downward trend in rail market share is clear. Unfortunately, because of the flaws of previous surveys and the absence of flow data, the specifics of this decline have never really been understood. Growth rates for constant GDP at 2000 prices, physical production in the economy and tons transported can now be compared between the NFFM and the previous studies analysed. This is shown in Table 6. The survey methods followed by Verburgh, Hamilton, Smith and Pretorius are essentially the same and could, therefore, serve as a good base for comparison. The Verburgh-Smith-Hamilton time series performs satisfactorily in this comparison, as the growth in tons transported correlates well with the growth in GDP. The faster growth in the physical volume of production in the economy (compared to GDP and transport growth), however, could not be explained by the commissioning of South Africa's two export machines in the 1970s, namely the Richards Bay coal line and the Sishen to Saldanha iron ore line, because in both these cases the results should also have translated into higher transport volumes. It is also hypothesised that more double handling of goods in a more mature economy (caused by specialisation) should occur, which means that tons transported should probably grow somewhat faster than the physical volume of production in the economy. The Pretorius time series did not do well in these comparisons. 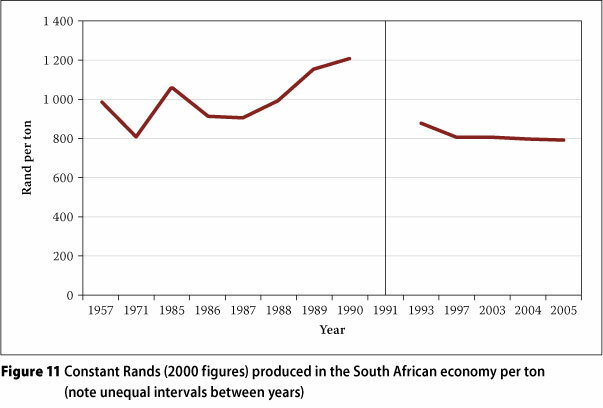 Constant GDP growth in South Africa was slow in the years just before the legitimisation of the ANC and the release of Nelson Mandela, and the physical volume of production slowed to a compound annual growth rate of just 0.61%, but a negative correlation of more than 3% of tons transported is highly unlikely. The NFFM correlation performs well in all comparisons. Constant GDP grows faster than the physical volume of production as the economy matures and the tertiary sector expands. The expected increase in double handling results in a faster transport growth rate than that of physical production, but is more in line with GDP growth. A more precise measure of correlation would be to measure the correlation coefficient for the various data sets. For this calculation, for tons transported, the four annual data points from Verburgh, Smith and Hamilton's two surveys were used, the six data points from Pretorius's surveys between 1985 and 1990, and four data points from the NFFM between 2003 and 2006. This was correlated with GDP and physical production for the same time periods. The calculation is shown in Table 7. The results from the NFFM consistently perform significantly better than those of previous surveys. The data has been assessed at workshops by peers at the Council for Scientific and Industrial Research, Transnet, the Department of Trade and Industry, the Department of Agriculture and Transnet Freight Rail. Current indications are that the high correlation will continue in future applications of the model. As the work continues, the academic soundness of the research should be continually tested and reported on to determine if the positive correlation is valid for longer time series. In South Africa there are 329 billion ton-kilometres of freight movement per annum (National Freight Flow Model estimates), compared to approximately 15 000 billion ton-kilometres worldwide (Rodrigue 2007). South Africa has just less than 1% of the world's population, produces less than 0.4% of the world's GDP, and yet it requires more than 2% of global freight transport in terms of ton-kilometres. Therefore, South Africa's transport demand is excessive in the light of these indicators. ■ a beneficiated product- and energy-import economy. These factors consequently necessitate long export and import corridors. This situation places, ipso facto, a massive burden on South Africa's transport infrastructure, and, because of the country's poor productivity, a specific need for excessively cheap transport. The South African economy is still relatively primary, especially when compared to developed economies, and a better understanding of the specifics of the freight flow market segments is required in order to formulate an appropriate freight transport strategy. 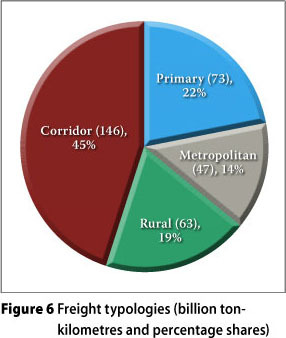 The 329 billion ton-kilometres of freight is divided into the four freight flow market segments as depicted in Figure 6. The tonnage growth across the various freight flow market segments is depicted in Figure 7. The stagnation in rail is clear. All growth over dense corridors occurred within the road mode, which expanded by more than 70% over 13 years. This growth would be understandable if the corridors in question were short or the density per corridor low. In these instances the economy will have to absorb this growth in the road mode. Cheaper options are, however, available in intermodality, if the density per corridor can be calculated as sufficiently high. In South Africa's case, as observed by the national freight flow model, the spatial efficiency objective of the corridor freight market segment is not achieved. If this density is sufficient to entertain an intermodal solution, future investment should be considered in such solutions. This could release funds for the development of the secondary economy in rural areas, which is a major objective of the country at the moment. Rural road traffic has grown more slowly than corridor traffic (less than 60% growth), which supports the hypothesis that South Africa is not succeeding in the stimulation of rural economies as desired. A major cause of this failure is declining road infrastructure, the impact of which can now be measured for the first time. Metropolitan growth is also slower than corridor growth. The detailed results per freight market segment will point towards specific issues and possible solutions. These results are discussed in the following sections. The various corridors have performed differently in terms of growth over the past 13 years. The growth is depicted in Figure 8. 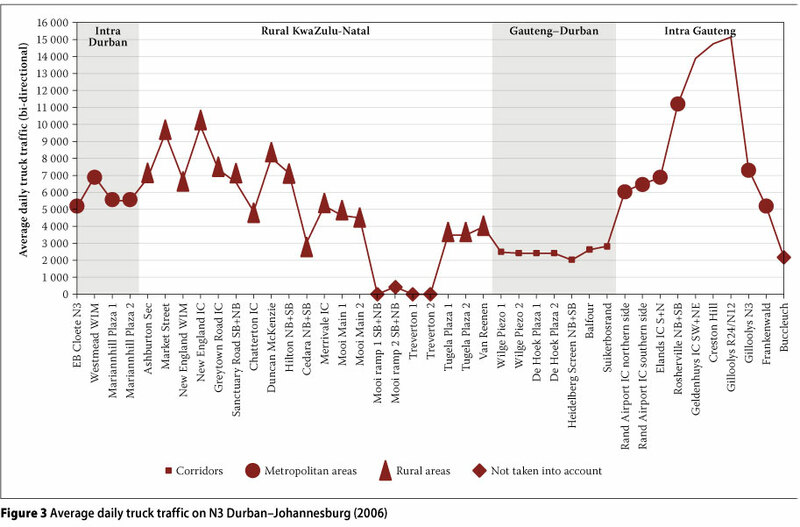 Growth on the densest road freight corridor - the route between Gauteng and Durban - was relatively slow (26%), but this is also the corridor that is probably the most overstretched in the country because of current density. Alternative routes (even as far afield as the Energy-Demoina route, which is the alternative, much longer route between Gauteng and Durban over Piet Retief) are often used because of, inter alia, lack of policing, lower density and the presence of fewer toll roads. From this high base, if the road/rail market-share position should continue, major long-haul congestion problems will arise in the future. The eastern corridors describe the roads to Witbank, Nelspruit and Maputo from Gauteng. There has been a major initiative over the past few years to develop this corridor, but freight has grown by only 46% over the time period (the second lowest - and slower than economic growth). Furthermore, the expected growth in rail traffic has not yet been realised. 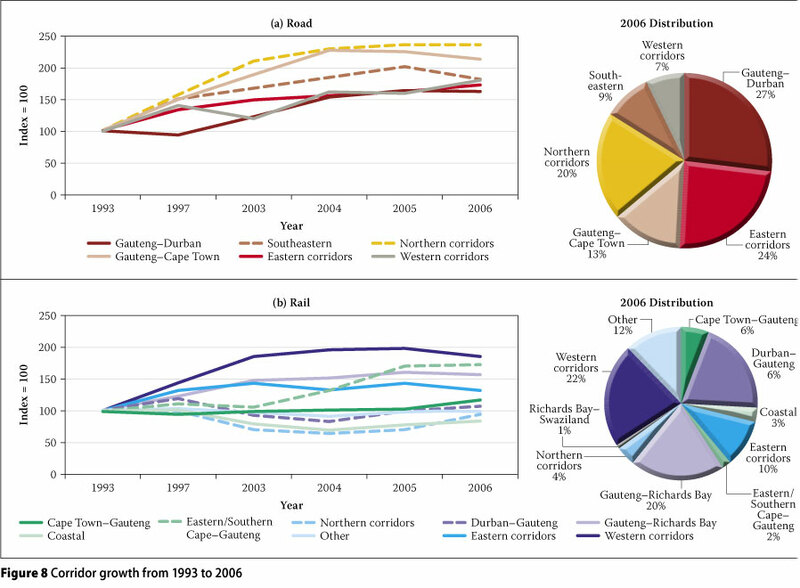 The Gauteng to Cape Town corridor achieved 135% growth over the time period - almost all on road. This is perhaps the greatest error in South Africa's infrastructure planning framework, as this is also the longest corridor and should, by any standard, be more rail-bound than the rest. Almost all known metropolitan areas (or areas usually classified as metropolitan) experienced growth of between 50 and 60% over the period, as depicted in Figure 9. This pattern of rail freight decline is normal for the shorter distances involved and may seem acceptable to planners, but it should be remembered that dense metropolitan areas are growing from an already high base (given the current available infrastructure that is installed and planned). In addition, 86% of all metropolitan freight in South Africa moves within three metropolitan areas, and 41% of all freight shipped in South Africa originates and terminates within one of these same three metropolitan areas. In very specific cases rail solutions are possible to alleviate pressure on metropolitan infrastructure. An example includes the bale-by-rail solution that was developed for Vissershok in Cape Town, whereby a ring-fenced fleet delivers baled waste over defined and limited origin-destination pairs to a landfill site outside Cape Town. 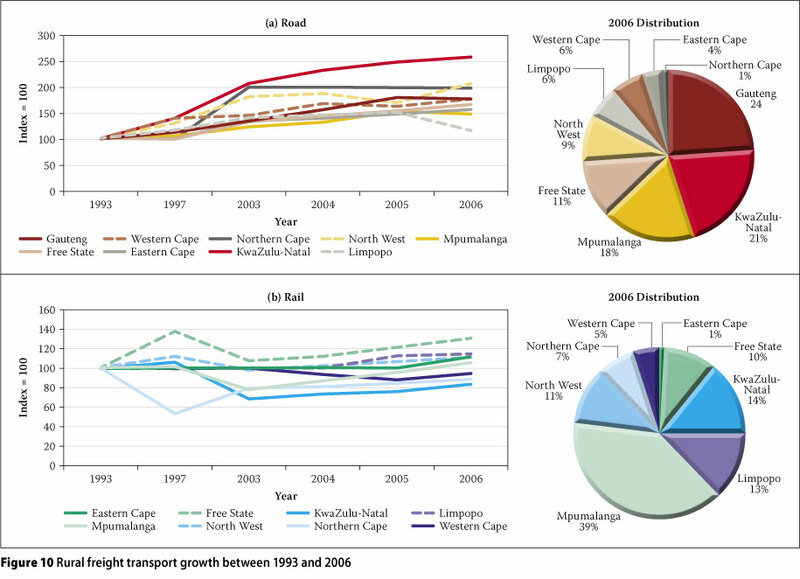 The biggest rural growth was experienced in KwaZulu-Natal, where rural freight movements grew three times faster than in the Eastern Cape, as indicated in Figure 10. Government's failure to deliver on objectives for the rural Eastern Cape region is clearly evident. The application of the NFFM as lead indicator has now been adequately defined, given the specific planning information for the freight flow market segments that was generated. Possibilities also exist to use the data to develop lag indicators that can measure the performance of the economy in terms of transport consumed. GDP data, physical production data and sectoral GDP are known and a calculation is, therefore, possible (see Figure 11). The time frame over which the performance of the NFFM is measured is short (with only five data points), and the previous measurements erratic and unreliable. The increasingly poor performance of the economy in terms of transport productivity is, however, clearly visible where the economy generated less than R800 for each ton transported in 2005. This measure over time could inform the spatial performance of the economy (about which only hypotheses have existed up to now) and contribute towards a better understanding of the spatial dilemma. As the tertiary sector in a mature economy grows, the measure should actually improve and, furthermore, improve with increased productivity in transport. This is, however, not the case in South Africa. The measure can be extended to indicate measures for the transportable economy (see Figure 12). This measure also indicates a declining trend and the poor performance of spatial reorganisation, spatial requirements and transport productivity in South Africa. This was the first successful attempt to develop annually repeatable flow data for South Africa, and the results provide the most complete picture of surface freight flows yet in the country, including modal market share. The data was compared with other economic data and with the Verburgh, Smith, Hamilton and Pretorius studies and performed well on all accounts. The results have also been applied to initiate the process of generating economic performance data for transport. The lead indicators (namely, modal market share in total and correlation of freight transport with GDP per freight market segment), which could inform transport and logistics infrastructure planning, and the lag indicators (namely, performance of GDP and transportable GDP per ton), which measure past performance of transport in the economy, have now been defined. The results indicate that long-distance corridor growth is being captured by road transport. The spatial efficiency objective of the corridor freight market segment is therefore not being achieved and the development of intermodal solutions should be paramount. This could release funds for the development of transport infrastructure in rural areas to support the development of the second economy. In addition, more sustainable rail solutions for specific ring-fenced metropolitan flows should be investigated. The NFFM also provides a basis for forecasting. The existence of a volumetric measurement means that associated logistics costs can be developed, which will inform the affordability of transport infrastructure, as well as determine the degree to which economic infrastructure supports or dampens South Africa's global competitiveness. South Africa is also in the process of developing frameworks for freight transport regulation, and volumetric data on freight flows will be invaluable in the process of establishing a freight regulation framework. 1 This means, for example, that if a specific load originated in Caledon in the Western Cape and was sent to Johannesburg, it will be observed by the model as a rural Western Cape load and a load that used the Cape Town to Gauteng corridor. In another example, if a load originated in Durban and was sent to Beitbridge, it will be observed as using both the Durban to Gauteng and Gauteng to Beitbridge corridors. 2 The current counting technology does not allow distinguishing between light delivery vehicles (colloquially 'vans' or 'bakkies') and passenger vehicles. The model results therefore exclude freight transport that is conducted in vehicles less than small truck size. 3 The current counting technology only allows the distinguishing of bus counts at toll stations, not at other counting points. Bus counts at toll stations account for approximately 1% of traffic counts, and are aggregated with heavy vehicle counts in the SANRAL data. Currently no adjustment to the NFFM is made for this, as bus counts on other routes are probably significantly less than 1%. 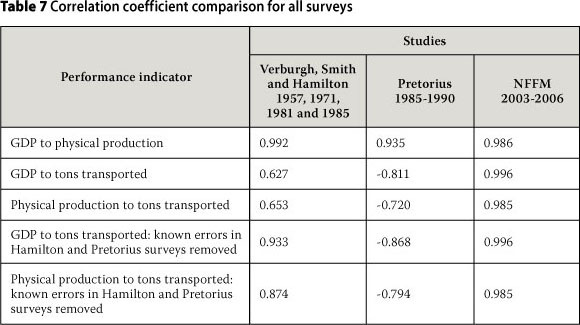 4 Hamilton's flawed survey of 1981 excluded and Pretorius's data normalised with actual rail data. 5 Hamilton's flawed 1981 survey excluded. DR JAN HAVENGA's core expertise is the development of a sustainable national strategic vision for South Africa's freight logistics industry, in close collaboration with the major private and public freight logistics stakeholders. The work is built on a world-class market intelligence system defining South Africa's current and future freight flow market space and related logistics costs, developed under his leadership. His research is published in peer-reviewed papers and delivered at local and international peer-reviewed conferences. He has consulted to more than 100 companies in many different countries, including South Africa, Mozambique, Germany, the UK and the USA. He is passionate about knowledge sharing and is also a full-time under- and post-graduate lecturer in the Department of Logistics at the University of Stellenbosch. PROF WESSEL PIENAAR has obtained the following advanced qualifications: MEcon (Transport Economics, University of Stellenbosch); MS (Civil Engineering, University of California, Berkeley); DComm (Transport Economics, University of South Africa); and PhD (Eng) (Civil Engineering, University of Stellenbosch). In 2000 and 2011 he received the Rector's Award for Outstanding Research at the University of Stellenbosch. He is rated as an established researcher by the National Research Foundation, and is a board member and vice-chairman of the "Suid-Afrikaanse Akademie vir Wetenskap en Kuns". He is chief editor and main author of the internationally used textbook Business Logistn Management: A Supply Chain Perspective (Oxford University Press). His work has been translated and published in German, French and Russian by international research institutions.